All pedigree breeds of dogs have a breed standard (usually maintained by a national or international breed association) describing the desirable characteristics that a specimen of the breed should possess in order to fulfil the function that the breed was developed for. The standard will also describe undesirable features that may, at first sight, appear cosmetic but that usually have a functional (or dysfunctional) basis. In the case of the Irish Wolfhound the original breed standard was drawn up in 1885 by the following the efforts of Captain George Graham to rescue the breed from near-extinction. Since then the substance standard has remained relatively unchanged although there have been refinements in content and format over the years. Any change to the standard is the source of much debate as can be seen in the following link, http://www.fiwc.club/main/en/en_standard.html. Similarly, as of mid-2017, the FCI standard was due to include an overshot bite (the upper canines project beyond the lower canines) as a fault in the standard. 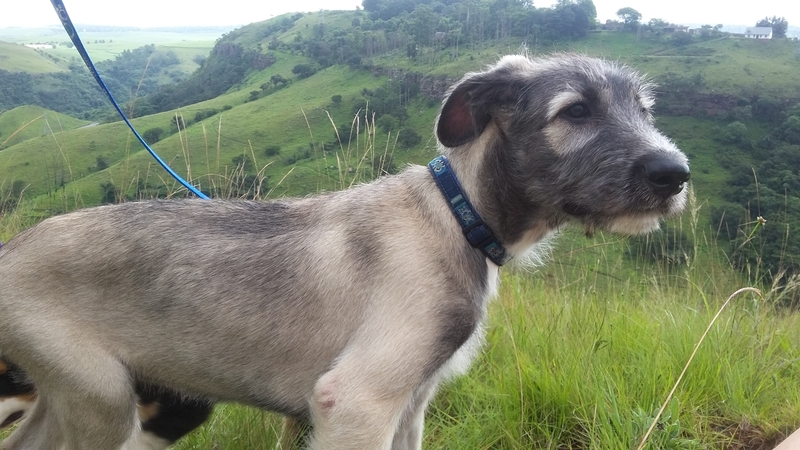 In the case of Irish Wolfhounds in South Africa the official breed standard used by judges is that adopted by KUSA (Kennel Union of South Africa) and published on their website. 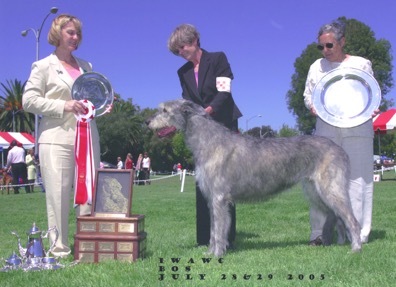 https://www.kusa.co.za/index.php/documents/breed-standards/hound-group/1040-irish-wolfhound-2 . This standard is the same as that of the Fédération Cynologique Internationale (FCI) that has developed a standardised format for breed standards. 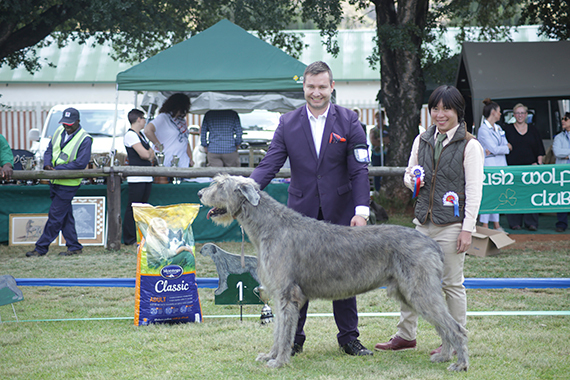 In the case of the Irish Wolfhound, the FCI breed standard omits the “points in order of merit” that are still used by some breed associations and are dear to the heart of many wolfhound admirers. The points in order of merit serve as a useful overview of the breed and are set out below. 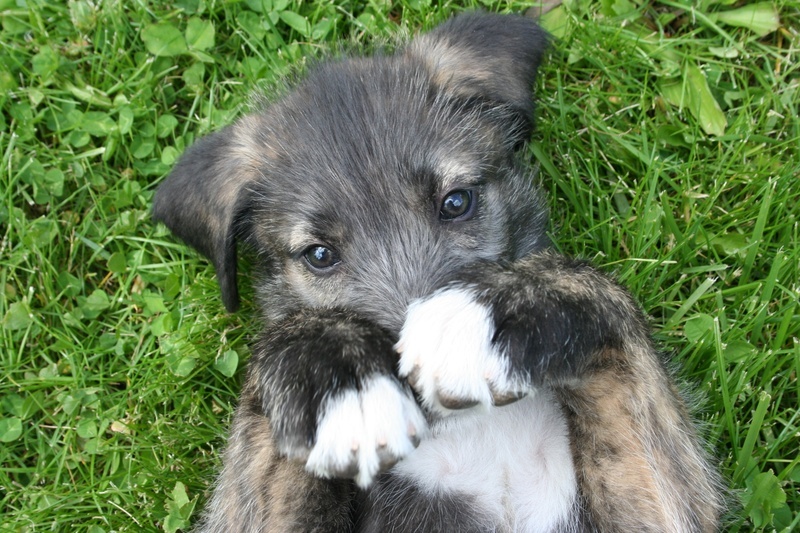 The Irish Wolfhound is a rough-coated Greyhound-like breed, the tallest of the coursing hounds and remarkable in combining power and swiftness. Thighs, long and muscular; second thighs, well-muscled, stifles nicely bent. The continental Celts kept a greyhound, probably descended from the greyhounds first depicted in Egyptian paintings. Like their continental counterparts, the Irish Celts were interested in breeding large hounds, but theirs seem to have been even bigger than the more ancient variety. 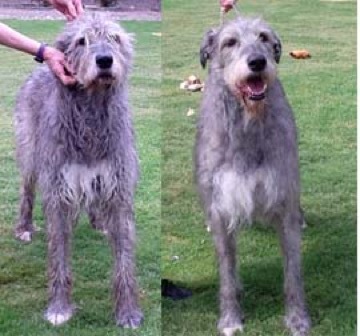 These large Irish hounds could have had smooth or rough coats but, in later time, the rough coat predominated possibly because of the Irish weather. 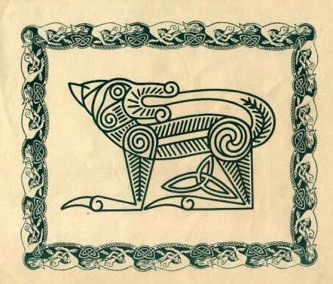 The first written account of these dogs was by a Roman Consul in 391 A.D. but they were already established in Ireland in the first century A.D. when Setanta changed his name to Cu-Chulainn (the hound of Culan). Mention is made of the Uisneach (1st century) taking 150 hounds with them in their flight to Scotland. 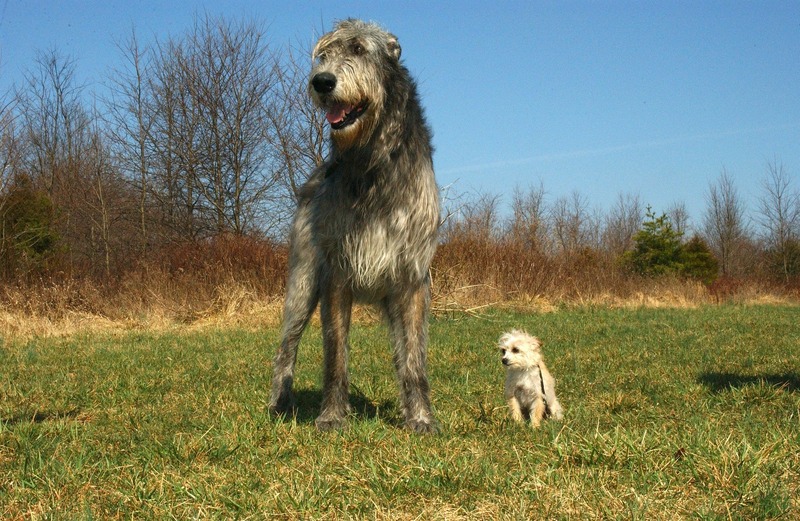 Irish hounds undoubtedly formed the basis of the Scottish Deerhound. Pairs of Irish hounds were prized as gifts by the Royal houses of Europe, Scandinavia and elsewhere from the Middle Ages to the 17th century. They were sent to England, Spain, France, Sweden, Denmark, Persia, India and Poland. The change of name to Wolfdog probably dates from the15th century when each county was required to keep 24 Wolfdogs to protect farmers flocks from the ravages of wolves. The Cromwellian prohibition (1652) on the export of Wolfhounds helped preserve their numbers for a time but the gradual disappearance of the wolf, and the continued demand abroad, reduced their numbers almost to the point of extinction by the end of the 17th century. It was probably part of the surge of the Romantic nationalism which helped interest in the breed. 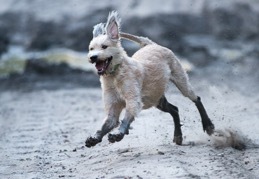 The Wolfhound achieved a true strain only through fairly frequent inbreeding, but the results were ultimately accepted as a legitimate revival of the breed. A club for the Irish Wolfhound was formed in 1885 and the Irish Kennel Club scheduled a class for the breed at their show in April 1879. 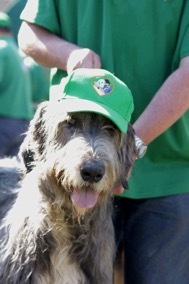 The Irish Wolfhound now enjoys once again something of the reputation it had in the Middle Ages and excites the most interest because it is a living symbol of Irish culture, a remembrance of the Celtic past. When one in lying in a hospital bed, attached to various bags and machines by tubes and wires, it can be a dispiriting and frequently lonely time. But what if, lying there one was suddenly to see the smiling face of a great, hairy hound level with yours? The joy that therapy dog visits have brought to numerous patients is difficult to comprehend, but from patents dying in the oncology ward who have taken solace in the company of a dog visitor, through people who have just lost a friend or family member have leaned on strong canine shoulders while they have cried for their loss, to the numerous patients have spent a little time distracted from what ails them in the company of a doggy friend, these visits make a difference. 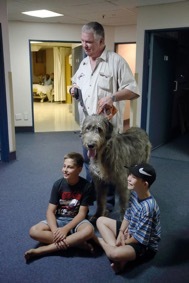 Our therapy dog group is involved in various different kinds of therapy work, from school visits to working with autistic children and children suffering from epilepsy, visits to old age homes and so forth, but it is the hospital visits that are arguably the most challenging for the dogs, but also the most rewarding. Mankind has an undeniable bond with dogs. This bond has been built over the last twenty thousand or so years, and it seems to be encoded into out very genes. A number of studies have indicated that simply being in the company of a dog can promote the brain to release endorphins, can reduce stress levels and lower high blood pressure as well. It is a proven fact that people who interact with animals during the healing period heal faster than those who do not, and the animal that has the greatest effect is the dog. Most people simply feel better after interacting with a dog. It brightens their day and makes everything seem a little better, and that is why dog therapy work is accepted and even encouraged by a large number of medical facilities and hospitals around the world. 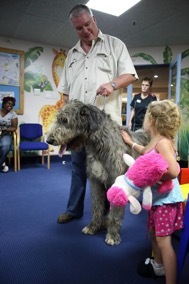 Of all the therapy dogs I have ever met, Wallace the wolfhound was one of the greatest. Not because he was the best, there were and are a number of smaller dogs who did and do a better job actually interacting with people than he did, but the one of the greatest because of the incredibly positive impact that his mere presence had on patients. Without previously having met him, little children over whom he towered would run up to him and throw their arms around his neck. Patients in obvious pain and discomfort would visibly relax in his presence, and anxious family members waiting outside I.C.U. would become engrossed in talking to him. It was not that he ever did very much, he simply stood there, and was still. For Wallace had about him a truly magical quality of stillness. It was contagious. And if you were very, very fortunate, he might give you a little, gentle lick. Yet for all of that, he made a huge impact. People who only met him once stop us in the street and ask about him. The nursing sisters at the hospital burst into tears on hearing that he had left us, and a year after his last visit, people still tell stories of the gentle giant who visited them. Therapy dog work is not for the faint of heart. It is heart breaking to watch the suffering of people and know that there is little one can do but offer a few moments of respite. And it is very hard on the dogs. They must permit all manner of strangers to interact with them, often in cramped conditions where there is no retreat, and often by people who have absolutely no idea how to interact with a dog. And they must do this in a calm and outwardly friendly manner. In order for a dog and handler to become a therapy dog team, there must be several factors in play. First, there must be a passion on the part of the handler to do this kind of work. The dog must have a stable, and have an even, out going personality, and should not be nervous. The dog should also be in good health. And then there is the training. All the therapy dogs in our group are expected to have achieved a bare minimum of CGC Bronze, and be working towards Silver and then Gold, and all must undergo intensive training and then pass an evaluation by a behaviouralist. And once they are trained, they need to undergo constant, ongoing re-training to ensure that they remain suitable for the task. On the physical side, the dogs must be healthy and undergo regular veterinary inspection to ensure they remain healthy. They must be treated against internal parasites on a regular basis, and be treated against tick and flea infestation well. 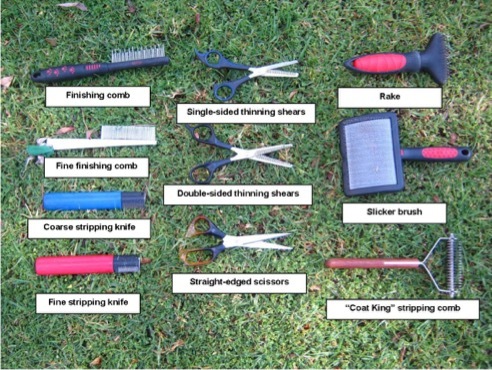 They must be groomed and cleaned before all visits, and always appear in good condition. 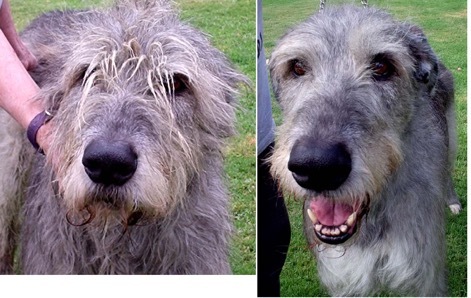 I may be just a tiny bit biased, but I believe there is no better way for your Irish Wolfhound to interact with the community than for him or her to do therapy work, and there are no better dogs to do therapy work that the Irish Wolfhound. Sadly, Wallace left us in December 2016, but he had already been retired for some time before than. Dougal, Reilly and Stirling had in the mean time qualified, and all continue the great work that Wallace started. It is a pleasure and a privilege to see them work their magic. The puppy is going to grow into a large, powerful animal that is likely to be stronger than you are. You must be able to control it so that it is not a danger to humans and other dogs. Dogs are pack-animals and the owner is a member of the pack. Within the pack there is a strict pecking-order and through training the puppy learns that the owner is the pack leader. Although the puppy learns socialisation while with their litter-mates (one reason not to take them home too soon) training brings the puppy into contact with a variety of strangers and reinforces socialization skills. A well-socialized hound makes benching at shows and ring-work much less stressful on dog and handler. For the above reasons it is best to sign up to group training led by a professional trainer. The breeder, your vet or other hound owners can usually suggest an appropriate trainer; or you can contact the IWC. Show training teaches different skills (to the handler as much as the dog!) than basic training and professional trainers also offer show-training. The IWC often offers brief, refresher, handling workshops prior to Open and Championship shows. Now clicker training’s quite the fad. Results from some are not too bad. But if your methods fail for you. There’s something else that you can do. To help you with your dog sport game. To mind his training P’s and Q’s. You liquor train — you just don’t care.